The introductory lesson to the ‘Structure of the Earth’ will teach children what the earth is made up of and will develop their sense of order. It’s an activity that can easily be replicated at home and as well as stimulating, it’s a great way to spend time with your child and engage in conversation about the amazing world in which we live. For this activity, you’d need to prepare three glass jars (with lids) and fill one with sand, one with water (use blue food colouring to dye the water if you’d like) and the third with ‘nothing’ (air). 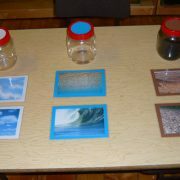 These three jars will represent land, water and air, respectively. You’ll also need four/five pictures of things that you’d see on land, water and air. Real pictures are the ideal (as opposed to drawings etc); just to give children a more realistic sense of their environment. It’s also nice to do this lesson outside, enabling children to pick up dirt, feel the breeze on their skin or play with water as they learn about it. Once you’ve organised the required materials, start the lesson by explaining to your child that we live on Earth, which is made up of three things: land, water and air – using the bottles to illustrate each point. 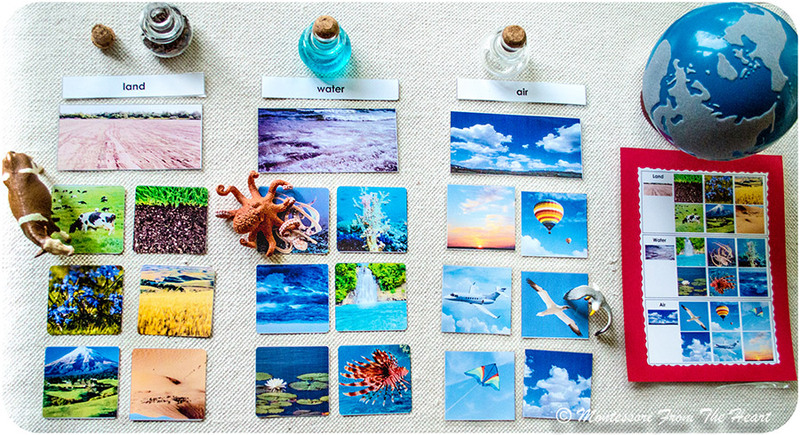 The pictures you’ve chosen are used to reinforce the principles of land, air and water; place naming cards in front of each jar and then explain the pictures in relation to each element. 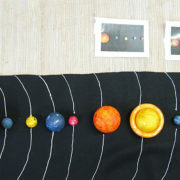 There are some fun extensions of this activity, including: the scientific terms for each element (as suggested in the video), namely land as the lithosphere, water as the hydrosphere and air as the atmosphere; the use of a map as a visual canvas for the ‘land, water, air’ concepts and relevant objects can also be used instead of pictures, to reinforce principles.